Although the Bloom 2 Bar Project is officially completed, I thought I might continue the occasional posting here that would relate directly to the work of the project. 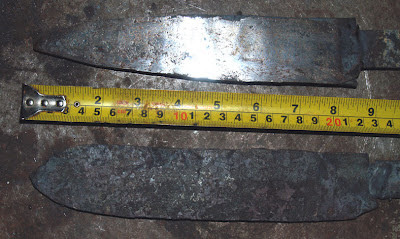 I had prepared two billets I intended to lead to a very specific bladesmithing design. 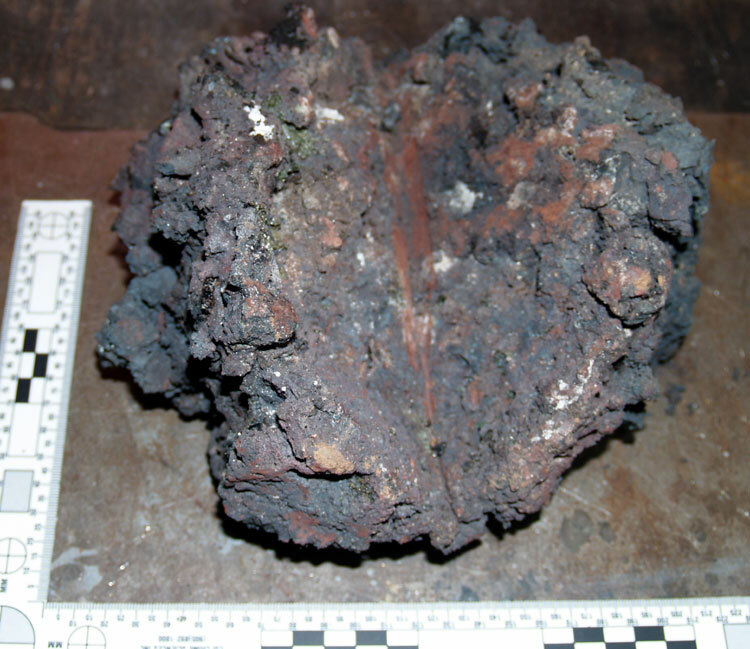 The top one is iron from Slag Pit 2 ( # 49 , November 2011 ) an the bottom from Black Rock (# 14, February 2006 ) In both cases the iron was deliberately used before much welding and folding had been done, specifically to allow cracks and irregular edges. I actually had gone a bit *too* far on the Slag Pit 2 iron, ending up with most all the flaws removed. For the second attempt, I was able to restrain my natural desire to forge in all the imperfections. In the lower image, the two blanks are at different stages in completion. The top blade has had the blade profile roughed out, and the first pass on forging the edge completed. The hilt is only vaguely shaped at this point however. Darrel so when you say 'weld in all the edges'... do you mean basically turning it on it's side and hammering down all the little bits at welding heat? I'm assuming this is easier with lower carbon steel and iron. On my very high carbon stuff.. those little bits just fall off. I would most certainly *not* hold my working methods up as the ideal! Jesus Hernandez also has a good visual tutorial over on his web site. I have also seen on this forum some good advice given by Lee Sauder on this same topic. 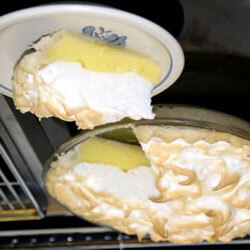 Blooms have a structure that Lee describes as 'like a custard' - think of a lemon meringue, turned upside down. The centre is a hard 'nut' of iron, often quite dense, with a spongy layer, often with a lot of air spaces and more slag included around the outside. As you might guess, a larger bloom might be cut apart, so more like a wedge of pie than the whole thing like you see on a small bloom. So your first step is just pressing downwards at welding heat, collapsing the air spaces of the outside 'meringue' and forcing them on to the hard nut in the centre. This does help on the edges however, which remain ragged. I have had some luck placing the then flat disk on its edge and pressing in / down. Its a tall thin shape, with soft edges, so the press tends to slide it sideways and I certainly find that process hard to control. Also the press works in a flat plane, and most often the bloom disk is round or oval. Taken together, I had found it just as effective to hand hammer the edges in. I would place the disk flat on the anvil, then lean way over so I can fire blows almost dead horizontal from the far side of the anvil back towards the disk and my tong hand. This also allows you to both heat and forge on section of the bloom disk at a time. Technically, the Bloom 2 Bar Project ended (at its most generous) May 15. I will however, continue to cross post items from my regular blog (Hammered Out Bits) here, for topics directly related to the theme of bloom into bar - and beyond. If judged by the budget included with my OAC Project proposal, the last actual 'grant day' would have been 43 days ending April 26. I decided to extend the project work to cover two last major elements. One was the iron smelt covered in the last couple of posts here. The second was an academic paper to be delivered at the International Congress on Medieval Studies at Kalamazoo Michigan. The conference ran from May 9 - 13, with my specific paper to be presented Thursday May 10. I've referenced the paper itself in an earlier posting here. I had given a first draft version at Forward Into the Past at Laurier University on March 31. Obviously I consider the various public presentations of both research and practical method, plus ongoing communications like this blog an esencial part of the entire Bloom to Bar project. The revised text of my paper 'An Iron Smelt in Vinland' will be eventually be published. Session organizers Ken Mondschein and Michael Cramer are working with Freelance Academy Press to collect a number of papers from the past 'If Those Bones Could Talk' sessions into a volume. Not to get too (!) side tracked, what I wanted to detail here was some other excellent reference sources for those seriously interested in bloomery iron smelting. Remember there are some links to instructional methods to your top right! The book costs 60, 56 Euros plus 21,4 Euros (to Canada). I would refer you back to yesterday's post for the details of the set up for this smelt. The first thing is don't do this alone. You *can* run a successful smelt as a lone individual. It is however a massive amount of work. - I spent a half day clearing out an old furnace and preparing the area and laying the base. - Then a fairly long day preparing, mixing clay and building the furnace. (Roasting ore was done separately, but the two batches there could have been undertaken during the work sessions above). 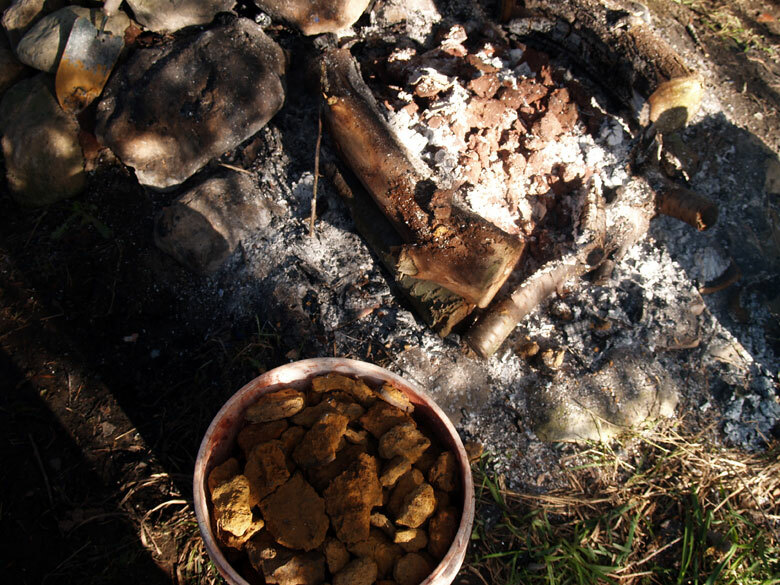 - Another half day gathering up the roasted ore, setting the tuyere and running a slow drying fire. I broke up 3/4 of the ore at the same time. 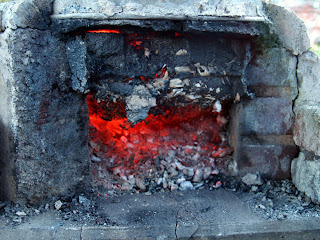 Smelt day, I broke charcoal while the first stages of pre-heat (with wood) was taking place. I started that day at 8 am gathering tools and getting them out and arranging the work site. The pre-heat was extended to allow time to break that charcoal (64 kg worth / 8 bags). The main smelt sequence itself ran over 7 1/2 hours, from first charcoal fill to start of the extraction. In the end I decided to use all of the 'Jamestown Brown' ore that I had roasted and crushed. The total ore added was just under 42 kg. The total charcoal consumed was 55 kg (7.5 full 8kg bags, before breaking). I had a real hard time getting this bloom free. I ended up having to break way 2/3 of the slag mass by chiselling it off in small pieces. I really have no clear concept of how long this took, but working down inside the hot furnace was absolutely exhausting. My guess is that I was at it at least a half hour. The total smelting session took 13 hours! 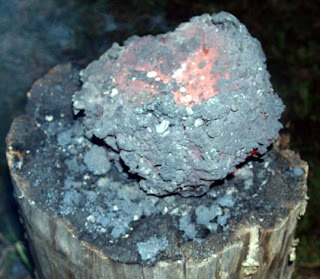 Slag mass, the furnace just opened. So by the time I pulled the bloom free, the bloom had cooled considerably. I did try to work over the surface with a 5 lb hand sledge. This did knock some of the clinging slag 'mother' free, but really was not effective in compacting the metal itself. I tried a fast weight measurement, but frankly I think the reading was not all that accurate. (What I recorded was 12.27 kg). Frankly, this is a much larger bloom than I normally make. I rushed the bloom back from the rear yard into the workshop. I had started my two burner gas forge before I started the extraction, but there was no way the mass would fit. Although the bloom was closer to a red heat at this point, I quickly started the hydraulic press. I made a partial compaction, but it was obvious that the bloom was far too cold, and several larger pieces broke free. I swapped in the cutting head and made a cut from both sides, most the way through. At this point I might have been able to get the individual 'half' sections into the gas forge, but frankly, I was way past too beat to work. This morning, I was able to pull the scored bloom off the floor, and sweep with a magnet to recover any fragments. The main bloom itself now weighs a quite respectable 8.83 kg. I recovered another 1.46 kg of fragments. Two pieces are a good size (at 501 and 324 gms) and look solid enough that I should be able to work them down to smaller bars. The overall yield (using the 10.3 kg total recovered) comes to roughly 24 %. 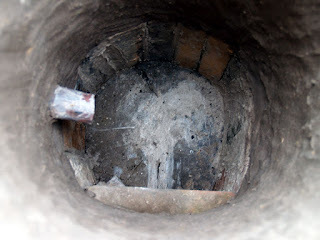 The furnace itself, despite all the pounding and prodding, was found to be in remarkably great shape the next morning. There is one very small crack right near the top edge, but otherwise the shaft is in perfect shape. The copper tuyere might have melted just a tiny bit. I'll have to measure it to be sure. The wall around the tuyere did errode a slight amount, but it does not look more than a centimetre or two. 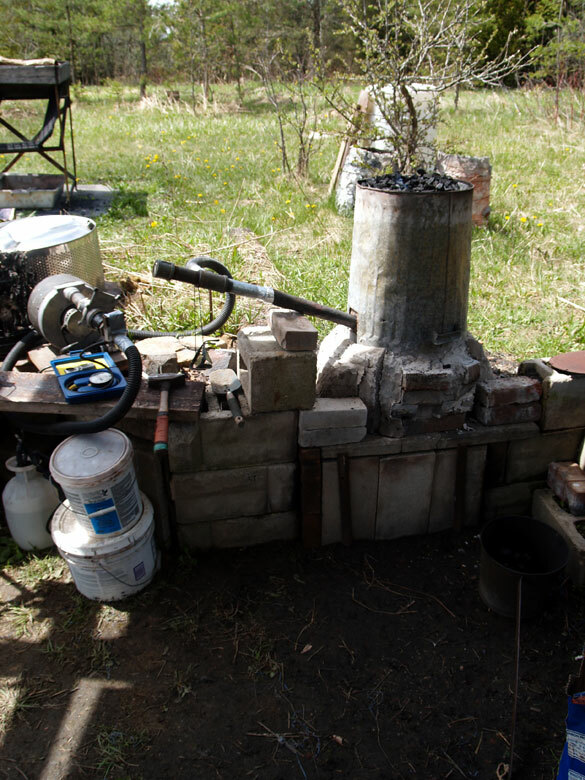 Although technically I am past the end date for the OAC Project Grant, one of the things I wanted to include was building a more production type furnace and running a test smelt. Layout with dimensions Before drying fire. You can see the layout includes a very deep base area, a total of 28 cm from the centre of the tuyere tip to the hard base. When set up for a smelt, the lower 12 cm or so will be filled with charcoal fines. The furnace also has a much larger tap arch. Taken together, this should allow for possible bottom extraction of the final bloom. The furnace is set on the upper level of the normal smelting area at Wareham. This does make it a bit tall for top extraction (top of the furnace is chest high on me). The advantage is that the bottom of the furnace is set about 18 inches off the ground, making it easier to work tapping or slag bowl modification. This furnace will use the new forged copper tuyere (detailed here). The interior view above was taken before the drying fire was started. You can see the usual insert tuyere position, 5 cm proud of the interior wall and set to 23 degrees down angle. The flat brick seen the bottom is supporting the tap arch at this point (the clay was still damp). Earlier in this week I had spent part of two afternoons roasting up ore. I still have a quantity of 'Jamestown Brown', a water deposited ore from that location in Virginia. A number of years back, a group of us were invited to pick some of this material that lay in a large sand bank at the rear of a rural blacksmith/gunsmith's property. Sheldon Browder & Steve Mankowski (from Colonial Williamsburg) have used this ore repeatedly since with good results. Late yesterday afternoon and early evening I started preparing the smelting area. I started a gentle drying fire using small wood splits inside the furnace. That process continued for several hours. At the same time I sorted out the work area for today's smelt. As well I continued crushing the ore I had roasted over the last week. The ore does seem a bit 'sandy' to me, with a visible variation in iron concentration and form. At worst this may mean some extra slag tapping, but the new furnace layout should provide for this. Its looking like I may be running this smelt today single handed. Although I have done this (once!) before, I'm expecting a hard day. Lets hope nothing goes seriously wrong with this new furnace. 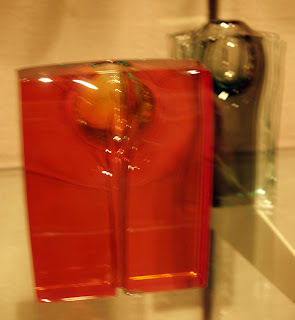 When I saw these glass objects by Patti at the Corning Glass Museum, I immediately thought of how the hydraulic press could alter the shape of a block of steel in a similar way. The tool was originally produced for potential use with my small air hammer. I never use secondary tools that much with the air hammer, primarily because of the small die surface (as repeatedly mentioned, only 1 1/2 " wide by 4 " long). Although it is true that lack of practice is part of that problem! It has a slightly tapered shaft forged from 1 1/4 ' round stock, so the working end is roughly 1 inch diameter. The shaft length is roughly 3 inches, made of mild steel. The handle is piece of flat stock, wrapped around and MIG welded on the top surface, then ground flush. The starting block was a piece of 1/2 thick by roughly 2 inch square. The resulting shape was made by setting the tool on the orange hot block, then driving it downwards. I used the full power of the press (to 3000 psi), primarily to see how far through I could push the tool. As you can see, what happened is that the tool 'bottomed out' at about 3/16 thickness. At that point the metal below the tool had most of its heat pulled off through contact with the tool and bed of the press. The increasing pressure then simply started to bend the shaft itself. Obviously not the way to go. Interesting potential however. The second test , at the upper right, (done April 17) started with modifying a tool. 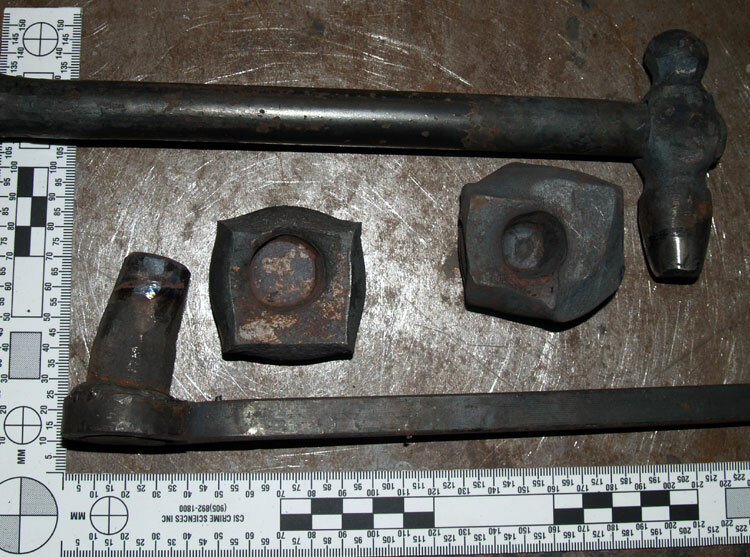 This small (cheap) ball peen hammer had been used for a different impression test initially. Result was that the pressure collapsed the walls of the eye around the original wooden handle. First I used a drift to re-open the eye and straighten the bent head. The hammer face side was forged down to approximately the same shape and size as a standard 3/4 inch taper base candle. Last I forged down a piece of solid 5/8 " round to fit, then drove that into the eye hot to seat it. The starting block this time was a piece of 1 inch square, about three inches long. First the hot block was collapsed downwards into itself. With a second heat, the tool was pressed down into the block. One unexpected result was that the ball top end actually left an impression into the mild steel top flat plate die set in the press. Not good. But the finished object? Closer, but still not quite. What is a 'Working Day' ? The last couple of days have been a bit messed up, certainly in terms of how they might track back into the grant project. Just how do you count a working day? Especially if you are a self supporting artist? People who have 9 to 5 'standard' jobs just don't get it. Yes, I do not have to go someplace at a fixed time, then do something I largely do not like, mainly for someone else's bennefit. But I also spend more time each day (even if its broken up) occupied with my 'job'. I also typically 'work' seven days a week. I don't have any holidays. Normally I'm up at about 7 AM (often much earlier). I dress, brush my teeth, go up to my office and turn on the computer. Grab a coffee. That puts me 'at work' by about 7:10 at the latest. Then I'm involved in business related activity until normally 10 - 10:30. This includes all the business communications, which I in fact do first. This may be answering questions, preparing quotes and design work. Keeping my business records (including all that tax stuff for the sole bennefit of the Government). There is time spent on 'outreach' - here being researching, writing, formatting and posting for the blogs. Attempting to keep the web sites up to date. By about 10:30 or 11 AM, my brain is about toast. Some days the desk / computer work runs straight through to noon. By then I'm *really* fried. During the grant project, I have been seriously trying to keep 'non grant' work to a bare minimum. I'm keeping a daily diary, when I note what I've done each day. Note that I do not consider that work required as part of keeping the Wareham Forge functional as 'non grant' time. Monday I spent a hour compiling my quarterly HST, for example. 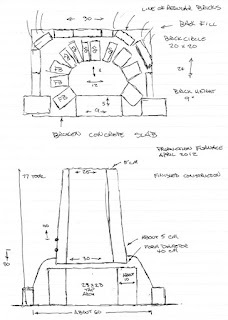 A counter point was that this morning I spent roughly a hour and a half making up a design rough for a possible project for *after* the grant runs out. That time I will not include under the project grant. Afternoons are generally spent in the workshop itself, normally starting some point between 1:30 - 2 pm. Once again, there is a lot more to undertake in the shop than just hammer at the forge. Supply trips (Monday morning I rushed in to purchase propane, elapsed time was 1 1/2 hours). Clean up and maintenance. Equipment construction and set up. Now take one of the work sessions documented here, say the one shown as 'A Typical Work Session'. First I need to figure out just what I'm going to do. This may include some organization and record keeping. Typically 15 minutes. Then, having selected the bloom to work on, I start the gas forge and start getting the required tools, etc organized. All while waiting for the gas forge to get through its pre-heat. Typically 10 minutes. Now I can place the bloom piece into the gas forge for its initial heat soak. 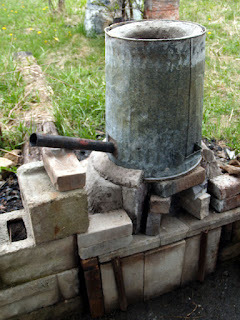 Then I turn my attention to the preparing the coal forge. Clean, sieve, lay and start the fire. Wait for that fire to run through its coking phase. Normally sweep the shop floor while this is happening. Typically 30 - minutes. 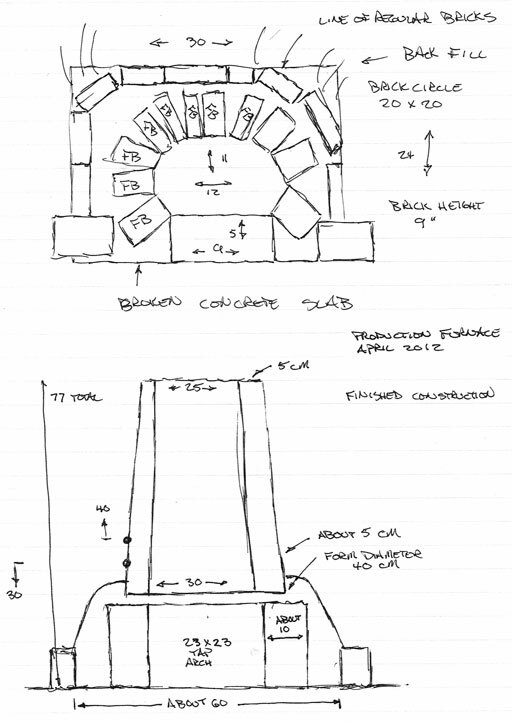 By now the bloom piece is pre-heated and can be transferred to the coal forge to bring it up to welding heat. This requires some attention. I dance back and forth preparing the air hammer and hydraulic press for operation. Elapsed time from when I entered the workshop till I pull the bloom piece out to the anvil? Typically 1 1/2 to 1 3/4 hours. Insert forging the bloom here, normally about 1 1/2 to 2 hours. Now at that point I'm, pretty much beat. Forging multiple kilogram masses at welding heats is exhausting and demanding work (even *with* my two machines). Add some time shutting things down. Normally its now something between 5 - 6 pm. I make that a 'normal' work day of 7 a to 5:30 p, with 1 1/2 hours average for lunch = 9 hours. Then there are the *long* days. Now do that basically 7 days a week. Taking the amount awarded in the grant and converting it into normal working days, at 5 per week and weekends off, the total came to * 43 * working days. Use that standard, with the 14 days for the Smeltfest research trip considered additional time. With the grant effective February 15, the last grant day would be Thursday April 26. See the 'day count' at the top of this post? I'm actually going to try to squeeze out additional working time past that April 26 date for the grant project. I have an academic paper to deliver at the International Congress on Medieval Studies on May 10. My intent is to extend my own work on this project to that date.